Of course it's loads of fun to receive an orchid in flower. But even more fun is the exquisite anticipation that builds as you await the very first flowering of a newly matured plant. Will it resemble its parents? Will it be a surprising new color or shape? Or something intermediate? Do you ever envy plant breeders who experience this excitement for a living? Think about it. Many of them wait years to see their photosynthetic offspring's first flowers. 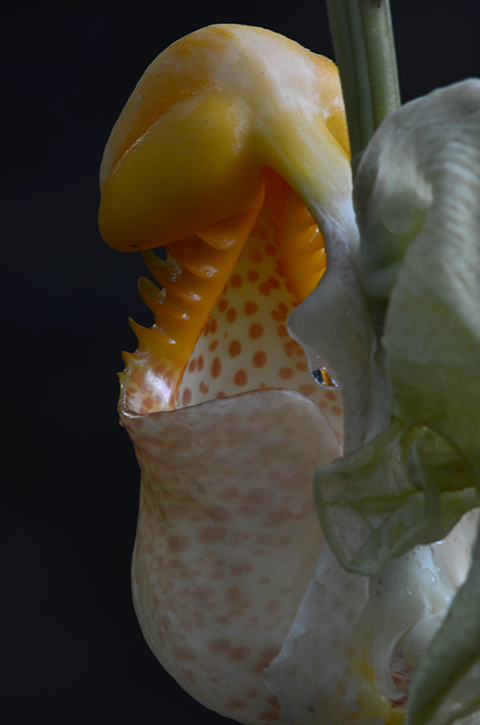 Flowering for the first time this month in our warm greenhouse are some seedlings of a fairly rare light colored form of Coryanthes macrantha, one of the Bucket Orchids. Usually only a small percentage of the seedling offspring of an atypical form will resemble their parents. So I was expecting flowers with the typical bold red splashes. Surprise! Our first seedling has bred true. The petals and sepals are nearly white. Of all the species of Coryanthes, Coryanthes macrantha is the most widely distributed. And throughout its range it exhibits some very striking color variation. 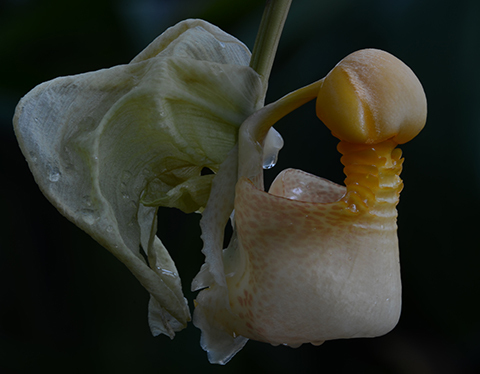 Dr. Günter Gerlach's Coryanthes page on the Munich Botanical Garden's website has an outstanding catalog of Coryanthes descriptions and photos if you want to go crazy looking at the diversity in this remarkable genus. 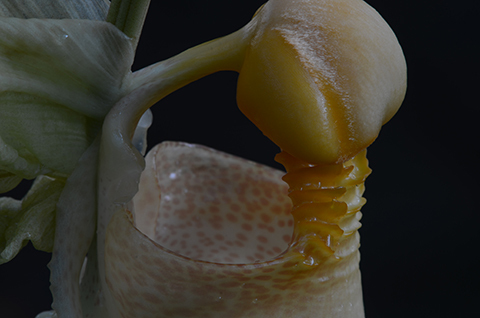 Dr. Gerlach notes that while the color and morphology of Coryanthes macrantha seedlings may vary throughout their range, the fragrances of all the clones that he examined are very similar. 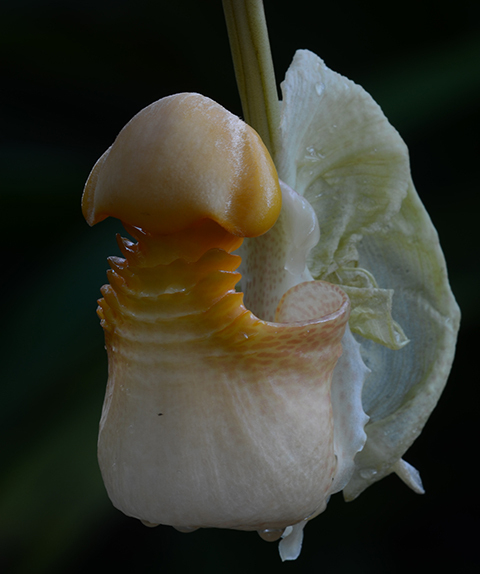 Coryanthes macrantha is pollinated by fragrance collecting Euglossine bees of the genus Eulaema.